I am currently the lead physical therapist for Oxford Physical Therapy Centers in Dry Ridge, Kentucky. While maintaining a busy outpatient orthopedic caseload, I am also nearing the completion of an orthopedic manual physical therapy fellowship with NAIOMT, as well as a Doctorate in Clinical Science through Andrews University. Currently, I am also faculty-in-training for NAIOMT. I serve as a lab assistant for NAIOMT courses held in Cincinnati, at Lebanon Valley College in Pennsylvania, and at Touro College in Manhattan, NY. I am a 2008 graduate of Regis University’s DPT program. In December of 2013, I officially graduated from the Andrews University/NAIOMT orthopedic manual physical therapy residency program’s initial cohort. I earned OCS designation in 2014 and CMPT (certified manual physical therapist) designation in 2015. Other certifications include: clinical instructor from the APTA and WorkWell Functional Capacity Evaluations certified. Clinical areas of interest include patient education, vascular risk assessment, and consideration in orthopedic manual physical therapy, the cervical spine, hip/pelvic girdle, conservative management of pars defects, conservative management of avulsion fractures, pain management, and post-graduate education. I owe my success to my wife and family, Brett Windsor and Terry Pratt, Erl Pettman and Kathy Berglund, Rebecca Lowe and Ann Porter Hoke, and my close friends Brandon Kiser and Tim Devlin. Without any of these individuals in my life, I would not be the person and PT that I am today. What made you decide to pursue residency training? I decided to pursue residency training for two main reasons: 1) To become a better physical therapist in the specialty area of orthopedic manual physical therapy and 2) To gain structured mentorship from passionate physical therapists. What residency program did you attend and why? I completed the NAIOMT (North American Institute of Orthopedic Manual Therapy) / Andrews University Orthopedic residency from 2012 to 2013. This program was in its candidacy when I first enrolled and was one of the very few hybrid programs at the time. This residency consists of both NAIOMT core classes/continuing education courses as well as academic/didactic classes through Andrews University in Berrien Springs, Michigan. Not too many soon-to-be graduates and new graduates are aware of hybrid residency programs. Hybrid residency programs allow the resident-in-training to work full-time at a clinic in his or her preferred area, negating the requirement to move away from a preferred geographic location for a year or more to complete an in-house residency program in an academic setting or with a different (or new) employer. I chose to attend the NAIOMT/Andrews residency program for a variety of reasons. Firstly, I was able to live and practice in an area of the country that suited me best, and an afforded me the opportunity to earn an excellent salary from an employer who recognized the value of post-graduate education. By doing so, I was able to start a family, expose myself to great practice opportunities, and grow professionally. Secondly, I earned academic credits toward a DScPT degree from Andrews University. In doing so, I was able to advance toward a goal of becoming a faculty member in a residency and/or fellowship program in the future, as well as involve myself in clinic research. And thirdly, I was able to expose myself to a different clinical perspective than what I experienced in graduate school and post-graduate continuing education opportunities. Can you give an example of a “typical” week in the residency program? A “typical” week in the NAIOMT/Andrews University orthopedic residency consisted of: managing an orthopedic caseload at my place of employment. Additionally, I had to keep track of each patient encounter per ABPTRFE standards. I also had to complete additional on-line coursework through Andrews University that built on foundational NAIOMT courses, as well as stand-alone Andrews University courses such as post-surgical orthopedic rehabilitation, research, and statistics, etc. What is your typical caseload in the program? The average workload during my time in the residency was entirely dependent on the clinic flow of my employer at the time. Because the residency can be considered a hybrid program, the fulfillment of ABPTRFE requirements for one-on-one hours, indirect hours, and percentage of caseload per body region was entirely dependent on my ability to plan, market, and treat the appropriate patient population. Additionally, I had to coordinate travel to my residency instructor’s clinic or his travel to my clinic. The total cost of the residency is approximate $12,000. However, this cost can be more or less depending on the benefits an employer may offer, the cost of travel to/from your residency mentor or your cost to travel to his/her clinic, and if you take your classes in Michigan or closer to home. My situation was unique in that my employer at the time recognized the value of post-graduate orthopedic physical therapy education and its benefits to other staff and patients down the line. In this way, the only out-of-pocket costs I paid were travel expenses for my residency mentor to my clinic. Even if I had not had the benefit of m employer fronting most of the cost of the residency, my salary would have still exceeded the median salary for outpatient physical therapists due to supply and demand. What opportunities have you sought out after finishing the residency program? Since graduating from the NAIOMT/Andrews University orthopedic residency program, I’ve entered the NAIOMT OMPT fellowship program as well as continued with Andrews University’s DScPT program, both of which I am nearing completion. I am faculty-in-training through NAIOMT, and seeking opportunities to both instruct and mentor the next generation. What have you gained from attending the program that you may not have learned otherwise? I think that I was able to elevate my clinical practice through both attainments of new knowledge and orthopedic manual physical therapy skills at a faster and more proficient rate than had I not done a residency. Most of my growth came through the structured mentorship and self-reflection that constructive feedback afforded me. What advice do you have for students that wish to pursue a residency after graduation? If you are interested in post-graduate education, take the time to research what is available to you. Too often, I’ve spoken with new graduates or soon-to-be graduates that are not aware that opportunities like NAIOMT/Andrews University, among others, exist. Should you choose to pursue any post-graduate residency, you need to do it for the intrinsic value it provides you: mentorship, growth, and self-reflection. Don’t enroll in a residency program because you think you will earn a higher salary; that’s simply not the case most of the time. 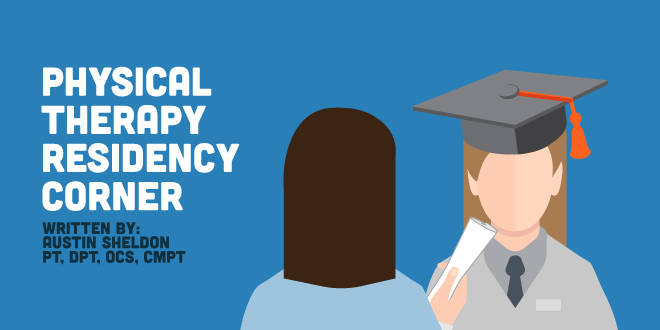 Enroll in a residency because you want to be a better physical therapist faster, for the benefits of the patient. Never chase initials for the sake of initials and letters after your name. For me, initials and letters after your name demonstrate a commitment to clinical excellence and show where you’ve been, not where you are going. Don’t pigeon-hole yourself, be open to challenge, be open to change. Physical therapy is such a dynamic and growing profession. We have so many great opportunities to better the world. Residency opportunities are just one avenue to pursue excellence and improve lives.